5-Hydroxytryptamine Receptor 3A (5-HT3A) belongs to the super-family of ligand-gated ion channels. Serotonin receptors, other than 5-HT3 subtype belong to the super-family of G-protein coupled receptors. The 5-HT3 receptor is formed by five subunits arranged around a pore forming unit. Receptors could be either monomeric, such as 5-HT3A or heteromeric entities like 5-HT3A/B. Indeed, the type of channel formed displays different pharmacological and electrophysiological characteristics. To date, five 5-HT3 subunits have been identified 5-HT3A-E, which show variability in the N-terminus and in the transmembrane region. 5-HT3A and 5-HT3B are the best characterized among the different types. In general, 5-HT3 receptors are located in the peripheral and central nervous system, in lymphocytes and intestil enterochromaffine cells. In presyptic neurons, activation of these receptors leads to an increase in intracellular Ca2+ (by both influx and mobilization of intracellular stores), and modulates the release of a number of neurotransmitters and neuropeptides. At the postsyptic level, activation leads to membrane depolarization. The 5-HT3A subunit is expressed in GABAergic and enkephalinergic neurons in the spil dorsal horn thereby marking its possible antinociceptive effect. 5-HT3 receptors have become important targets for which to develop treatments regarding irritable bowel syndrome (IBS), side effects resulting from chemotherapeutic treatment, schizophrenia and bipolar disorder. 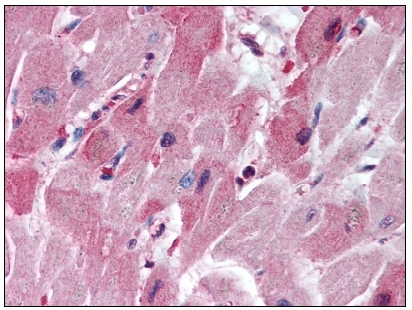 Anti-5HT3A receptor antibody IHC of human heart. Immunohistochemistry of formalin-fixed, paraffin-embedded tissue after heat-induced antigen retrieval. Antibody concentration 5 ug/ml. 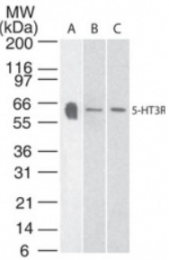 Western blot of 5-HT3R in human brain tissue lysate with anti-5-HT3R pcAb. 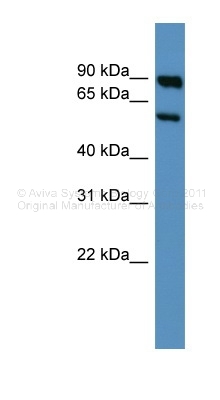 A protein band of approximate molecular weight of 47-50 kDa was detected. 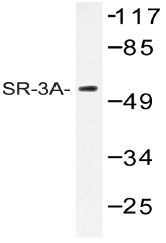 Western blot (WB) analysis of SR-3A antibody (Cat.-No. : AP20471PU-N) in extracts from HT-29 cells. Western Blot Image: Antibody (0.3 µg/ml) staining of Human Colon lysate (35 µg protein in RIPA buffer). Primary incubation was 1 hour. Detected by chemiluminescence. 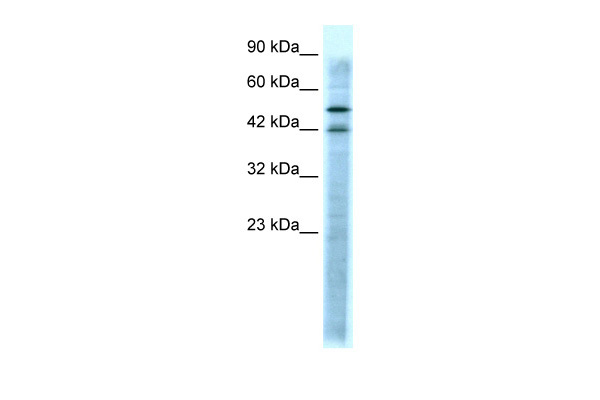 Western blot analysis of HTR3A Antibody (N-term) Cat.-No AP52128PU-N in MDA-MB453, K562 cell line lysates (35ug/lane). 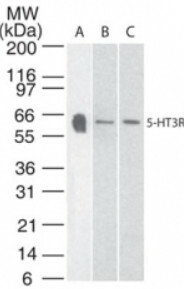 This demonstrates the HTR3A antibody detected the HTR3A protein (arrow). 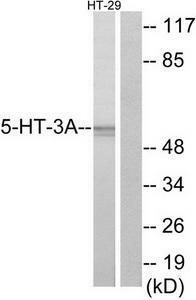 Western blot analysis of extracts from HT-29 cells, using 5-HT-3A Antibody. The lane on the right is treated with the synthesized peptide. Western blot analysis of Htr3a in A) human, B) mouse and C) rat brain tissue lysate using Htr3a polyclonal antibody ( Cat # PAB0187 ) at 3 µg/ml. 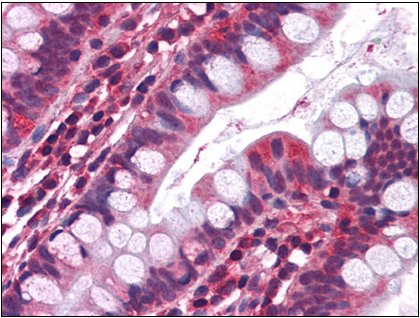 HTR3A polyclonal antibody ( Cat # PAB7069 ) ( 0.3 µg/ml ) staining of human colon lysate ( 35 µg protein in RIPA buffer ) . Primary incubation was 1 hour. Detected by chemiluminescence. 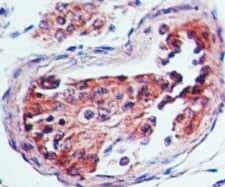 TA302602 (0.3µg/ml) staining of Human Colon lysate (35µg protein in RIPA buffer). Primary incubation was 1 hour. Detected by chemiluminescence. Western blot analysis of rat brain (lanes 1 and 3) and mouse brain (lanes 2 and 4) lysates: 1, 2. Anti-5-Hydroxytryptamine Receptor 3A antibody, (1:200). 3, 4. Anti-5-Hydroxytryptamine Receptor 3A antibody, preincubated with the control peptide antigen. 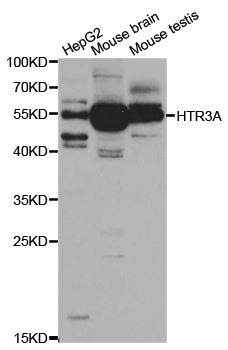 Western blot analysis of extracts of various cell lines, using HTR3A antibody. 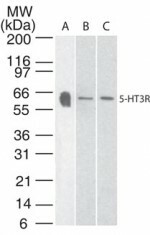 Western Blot: 5HT3A receptor Antibody [TA336339] - Analysis of 5-HT3 Receptor in A) human, B) mouse and C) rat brain tissue lysate using 5-HT3 Receptor antibody at 3 ug/ml. 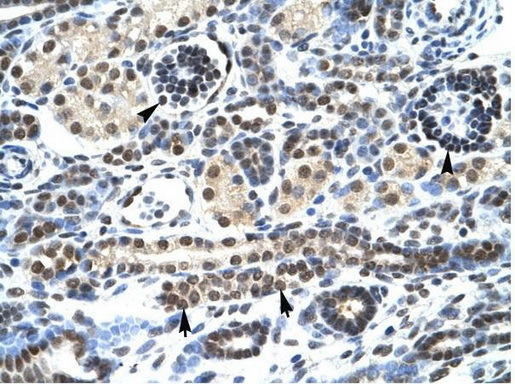 Immunohistochemistry-Paraffin: 5HT3A receptor Antibody [TA336339] - Analysisof 5-HT3R in human testis using 5-HT3R antibody at 5 ug/ml. Western blot analysis of extracts from HT-29 cells, using 5-HT-3A antibody.The lane on the right is treated with the synthesized peptide.